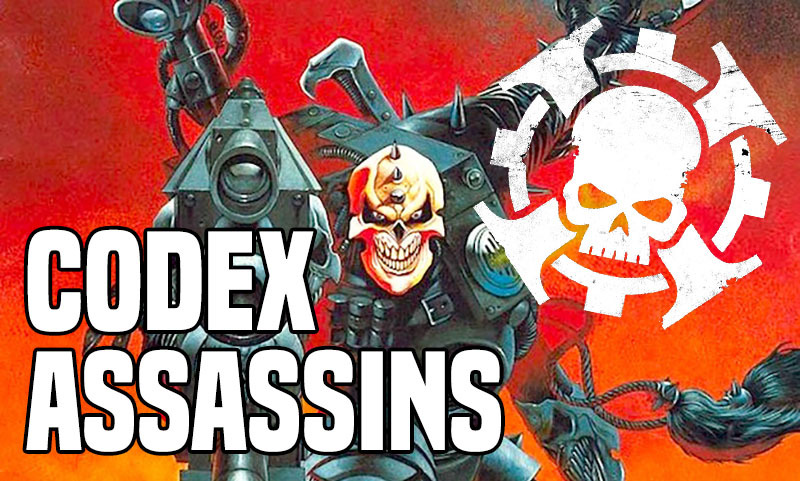 Today, we’re diving into a deadly classic – 1999’s 40K 3rd Edition Codex Assassins, that came enclosed in a White Dwarf. 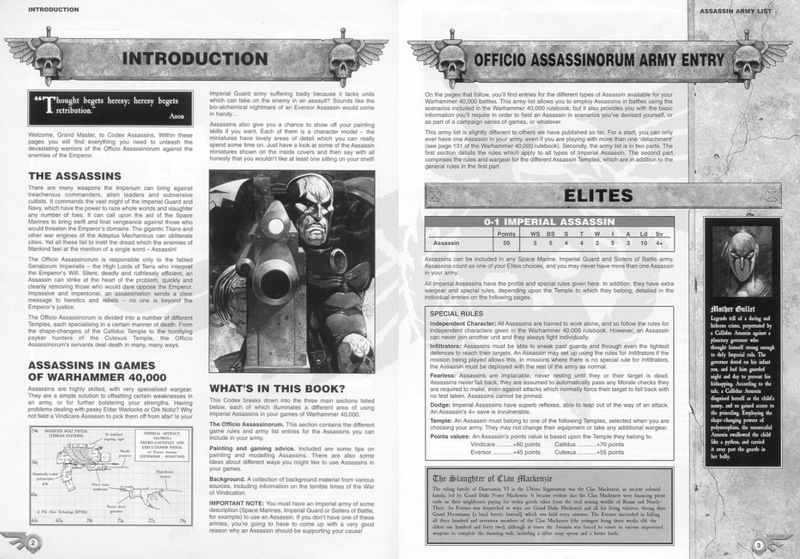 You get all the basics on what Assassins are, greatly expanding their background from the basics pr0vided in the Rogue Trader book of the late 1980s. Tearing right into the mini-codex gave us the stats and shared rules for the “basic Assassin” that the 4 temples were based on. All the basics were there – Fearless, the invulnerable dodge save, the infiltration, and Character status. 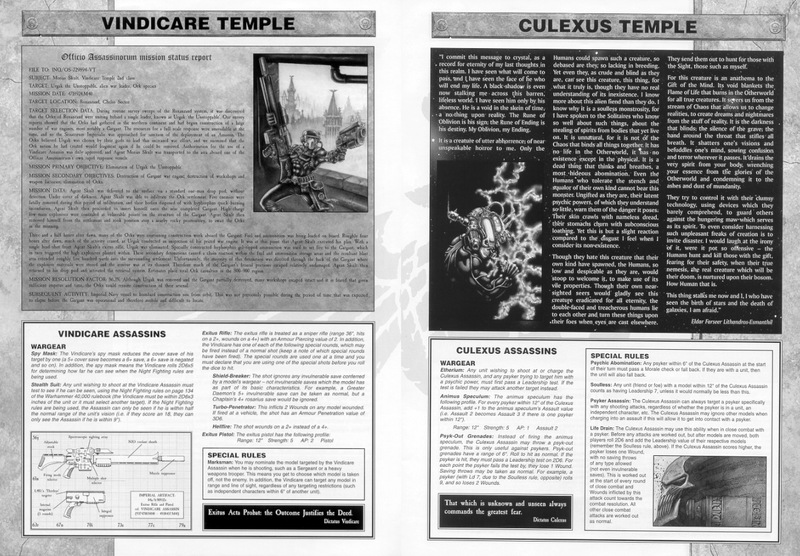 The Vindicare and Culexus were first up. 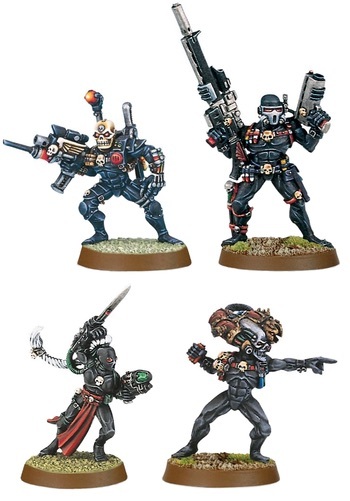 Back then, the Vindicare only got one each of his three special rounds, so you had to choose wisely. The Culexus was more an oddball back in 3rd without the psykers on every street corner we have now in 8th edition. This guy has only gotten better with age. 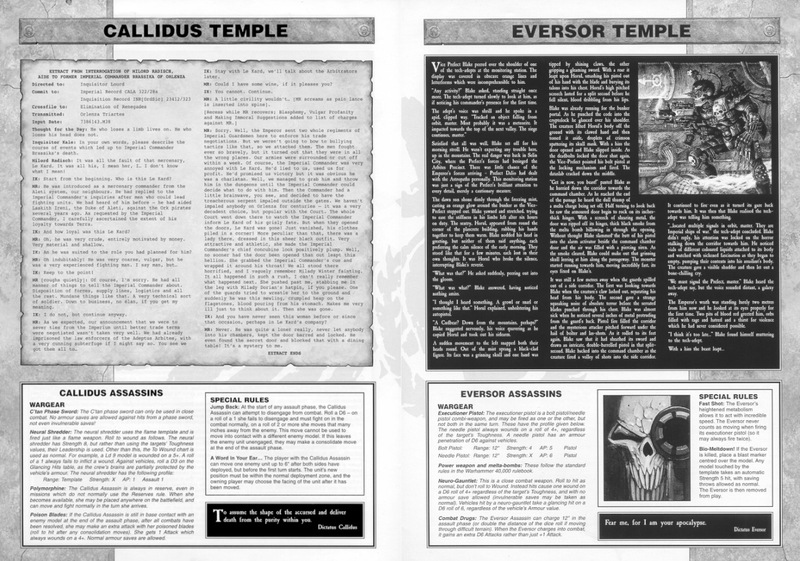 Next up, the Callidus & Eversor. The Callidus basic wargear is defined here, way before we had any idea what a “C’Tan” phase sword meant. Her Jump Back was an early precursor to Hit & Run and of course who can remember the endless fun of moving an enemy unit up to 6″ after deployment with A Word In Your Ear. The Eversor was and remains a one man murder machine. He arrives, he slays, he explodes. The end of the codex gave us some really teensy Force Org charts for assassins, a mission, and most importantly – tons of stories. 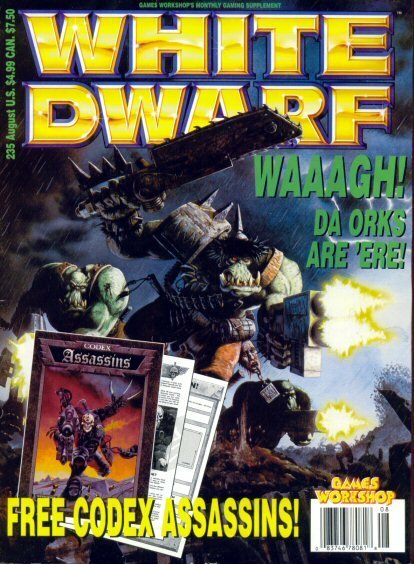 This little books is where we first heard of The Slaughter of Clan Mackensie – whose entire criminal family was wiped out by an Eversor who ran out of ammo and had to resort to “a soup spoon and butter knife”. Or Mother Gullet, a Callidus who killed a dirty governor, and disquised as a nanny, snuck his infant to safely in her belly after swallowing him whole thanks to polymorphine. We hear of an imminent WAAAGH stopped in it’s tracks by a single round by a Vindicare, who blew a Gargant construction site sky high, and an Eldar Farseer on the edge of insanity as he senses the inexorable approach of the void that is a Culexus. Great stuff! Last but not least we got the original 4 Imperial Assassins. These metal classics have been replaced by the new plastic ones, but they honestly hold up even today. 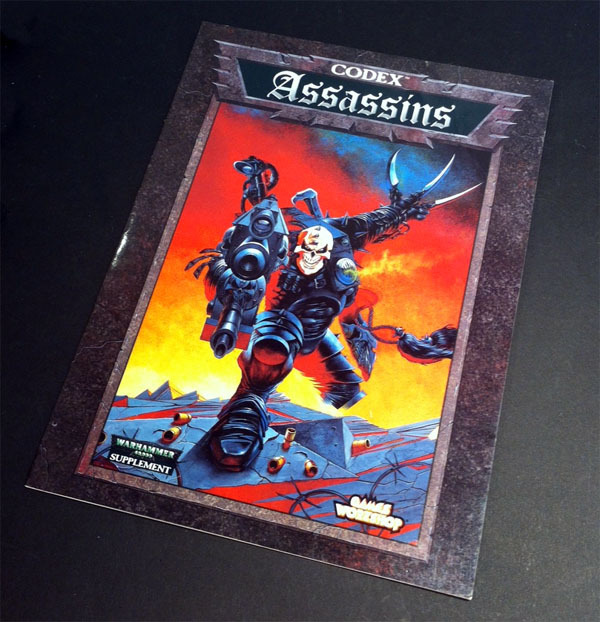 ~ Who remembers this codex, or has great memories of using Assassins back in the day? We want your stories in the comments!